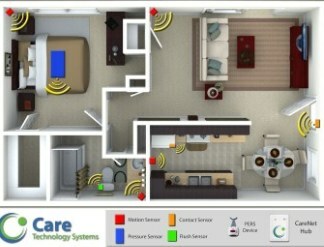 Care Technology Systems is proud to announce the release of the Active CarePendant™ for senior living providers. Packed with multiple sensors, the ACP™ monitors resident activity, automatically detects falls, and delivers immediate alerts to caregivers and staff. Care Technology Systems has partnered with BioSensics for the development of the Active CarePendant™. Based on over 10 years of research supported in part by the National Institutes of Health, BioSensics' technology uses advanced signal processing algorithms and novel biomechanical models of human motion to identify a complete physical activity map of the user from data measured by a single, lightweight, wearable motion sensor. That means that your residents are protected with the most advanced technology available, with less false alarms and more meaningful data. Feeling safe, while maintaining privacy and independence is a fine balance. Active CarePendant™ seamlessly integrates with the QuietResponse™ System. The system features sensors - not video cameras or microphones - that are installed in each residence to detect emergencies and call for help. Using occupancy, bed, door and other sensors, the QuietResponse™ system can evaluate activity and inform caregivers when there is a problem. Even if your residents aren’t wearing a pendant, the system can help ensure resident safety and provide your staff with the right data at the right time. The system can monitor blood pressure, weight, pulse and glucose levels to help caregivers keep track of the most important health indicators.